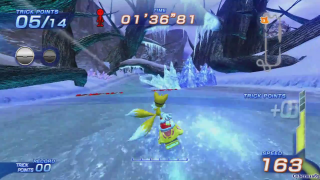 Frozen Forest is the third racecourse in Sonic Free Riders. This stage follows a winter theme, being set inside a forest that is frozen over similar to Snowy Kingdom from Sonic Riders: Zero Gravity. The course goes through a cave filled with frozen stalagmites and stalactites, green crystals and dinosaur fossils, finishing with a bobsled ride that takes racers out of the cave.